I photographed this painting in its micro plein air setting. 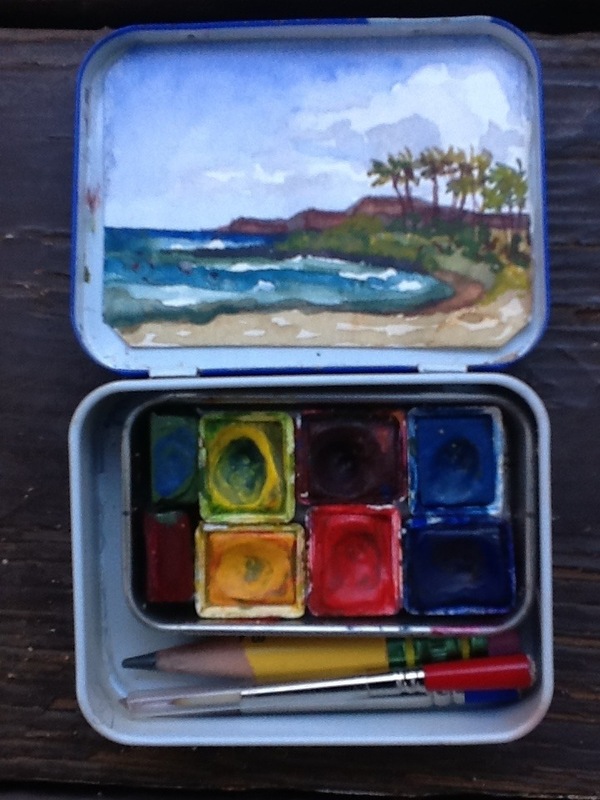 I lift out the tin of paints and use the empty box bottom as a palette, and water cup. The bottom corner holding my water, and then then I use the upper part to mix my colors. The tiny system works great, I encourage any artist out there to make there own, mine is made of mint tins and half pallets of water colors. I painted this on a break from snorkeling. The ocean was composed of many blues and greens which made it fun to paint. The multicolored fish under the water, the seal napping to my left, and the turtles popping up their heads you will just have to imagine. Next Article Wake up! Wake up! Nicely done! That IS tiny. I make my own mint tin palettes, too. Delightful!! What a cute setup.